Dutton Books for Young Readers, 9780525425250, 32pp. 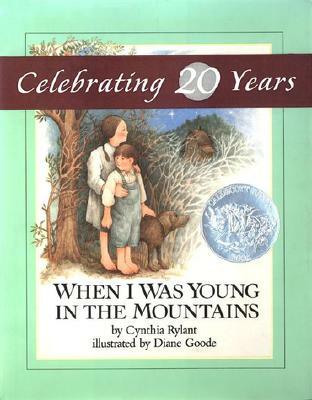 To celebrate its twentieth anniversary, When I Was Young in the Mountains is being released with a commemorative copper-colored band. As a child, Diane Goode loved books and art. She has been drawing ever since she can remember.Of Italian and French descent, she enjoyed the richness of both cultures and traveled to Europeevery summer visiting family as well as cathedrals and museums. She feels that these earlyimpressions helped shape her appreciation of art and life. She studied art history at QueensCollege, but switched to fine arts, in which she earned her degree. "I always begin with a rough dummy and then work on the individual pages, sketching veryloosely and quickly to establish movement and composition. I do these dozens of times,repositioning enlarging, reducing, adding and omitting. There are always hundreds of sketches foreach book. It sounds tedious, but it is the most exciting part of creating a book. When I msatisfied with these, I do the final art. All of my work is done on opaline parchment, a thin butstrong paper. I sketch lightly in pencil and use water colors applied with very fine sable brushes.Sometimes I use color pencils with the paint to soften the atmosphere." Diane Goode now lives in Watchung, New Jersey, with her husband David, an author and collegeprofessor. Their son, Peter, attends Rhode Island School of Design.